The Bunraku (文 楽) is the traditional Japanese puppet theater, with a history of 500 years and a level of complexity that makes it probably the most fascinating puppet theater in the world. It is one of the four types of classical Japanese theater (the others are Noh, Kabuki and Kyogen). While the use of puppets in Japan is very ancient, in predominantly religious contexts, it was from the Heian period (794-1185) onwards that puppets began to become a form of entertainment. There is historical evidence dating back to the twelfth century of groups of blind monks who sang heroic deeds accompanying the narration with the sound of an ancient string instrument called biwa. In the following centuries a new three-stringed musical instrument (shamisen) will be introduced first, and finally the puppets. In the Tokugawa period (1603-1868) the Japanese puppet theater was definitively recognized and was then called Jōruri. Puppet shows spread to Osaka, Kyoto and Edo (the ancient name of Tokyo). However, Osaka will be the main technical innovation center for several centuries. The period between the second half of the seventeenth and the first half of the eighteenth century was the golden period of bunraku, during which some of the most famous works of this form of theater were written, thanks to Chikamatsu Monzaemon (1653-1724), considered the greatest author of theatrical works in Japan, and to his successors. The golden period was followed by a period of crisis that led to the closure of several theaters and a scarce production of new works worthy of note, while the popularity of the kabuki grew more and more. The bunraku took its name from Uemura Bunrakuken, an artist born on the island of Awaji that in the early years of the nineteenth century moved to Osaka, where he began to stage his puppet shows, enjoying a good success and reviving the sector that had not recovered from the strong decline. Uemurà will die in 1810, and in 1872 the theater he founded will be moved to Matsushima and renamed Bunraku-za. During the twentieth century there was a new phase of decline. After the end of the Second World War, the bunraku began to be subsidized by the government to prevent its disappearance. In addition, bunraku artists were given the title of "Living Cultural Treasures", previously reserved only for the actors of the Nō and Kabuki theater. The bunraku is the expression of the union of three forms of communication: puppets, text and music. The success of the show is based on the invisible communication between puppeteers and narrator, narrator and musicians, musicians and puppeteers. The bunraku is a form of art at the same time literary, musical and visual, reaching a level of complexity that is not found in any other puppet theater in the world. Given the considerable size of the puppets (up to 130 cm high), it would be very difficult to maneuver them for one person. That is why every puppet is maneuvered by three people, bound by a strict hierarchy. The puppeteer in the center (omozukai) plays the most important role: he supports the puppet and maneuvers the right hand and the head. The second puppeteer in order of importance (hidarizukai) maneuvers the left hand, using a stick with a pin. The third puppeteer (ashizukai) maneuvers the legs. 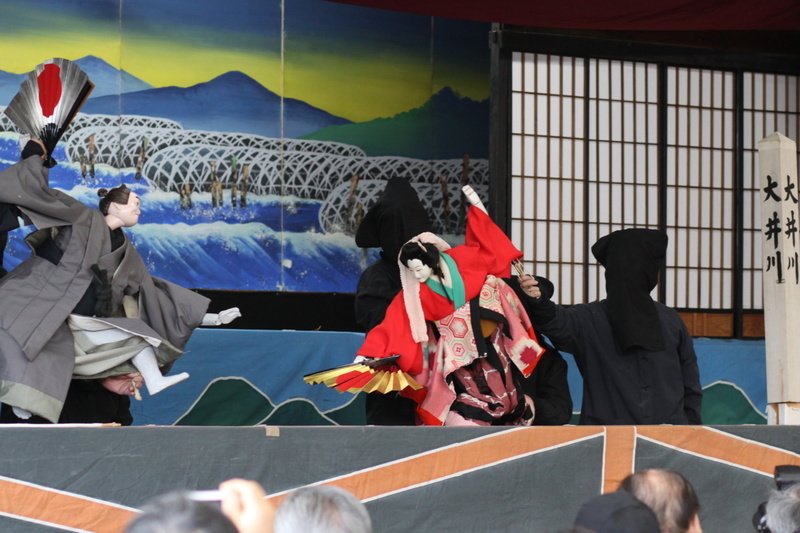 While the omozukai shows himself clearly to the audience and wears a traditional kimono (kamishimo) and wooden sandals, the two assistants hide from the audience, wearing black costumes, hood and veil over their faces. The "apprenticeship" period of a bunraku puppeteer lasts 30 years, ten years in each of these three positions. Only then one can be considered as a professional puppeteer. The magic of bunraku also lies in the fact that artists who maneuver the puppets are so skilled that it seems almost like it is the marionette that is dragging the puppeteers on the stage during the show. The story is narrated and commented by one person, who also gives voice to all the puppets. The narrator must therefore be able to perform a repertoire of voices large enough to represent all sexes and all ages. An experienced storyteller might play even fifteen roles in a show. He laughs, cries, whispers and screams. It is said that it takes three years to learn to laugh properly, and eight to learn to cry. The rhythm of the narration is given by the accompanying music of the shamisen, a three-stringed Japanese musical instrument of the lute family. The shamisen player pinches the strings of the instrument with a plectrum of ivory, slipping with his left hand along the neck of the instrument to change the tone of the notes. The music of the shamisen generally precedes or ends the action of the puppets, provides background music for the words of the narrator, accentuates and guides the movements on the stage, increases or loosens the tension. When there is a pause in the narration, the shamisen provides a musical bridge with the subsequent resumption of the action. When the shamisen is silent, all the attention is focused on the action of the puppets. Most of the staged works were written specifically for the bunraku during the 1700s. At that time the kabuki theater actors were so famous that they could often afford to change the works adapting them to their own preferences, and this used to annoy many famous dramatists, who sometimes preferred to write for the bunraku theater. One of the most famous was Chikamatsu Monzaemon. The topics covered in the bunraku theater, rich in intensely dramatic and emotional situations, are always aimed at an adult audience. The two main categories of works are sewamono (stories of everyday life), and jidaimono (historical themes). Sewamono works deal with topics such as adultery, suicide and murder. Sometimes, even the real news of a scandalous event could provide inspiration for the plot of a bunraku representation. The jidaimono works tell stories that are often complicated and fantastic, both referring to ancient legends and to contemporary events set in the past to avoid censorship. They deal with topics like ethics, loyalty and betrayal, sacrifice. An example of a work of bunraku, "The Love Suicides at Sonezaki"
The Love Suicides at Sonezaki (Sonezaki shinjū, 曾根崎心中) is Chikamatsu's most famous and beloved work. It was staged for the first time in 1703, based on a fact that actually happened, and it immediately became a great success. It remains today one of the most popular works of bunraku and given its popularity it has been adapted over the years to kabuki, movies, and even comics. The plot talks about the last days of a young orphan merchant, Tokubei. His uncle tries to convince him to marry a certain woman and also pays a dowry, but Tokubei refuses to marry her, because he was in love with the prostitute Ohatsu. After a series of unfortunate events he finds himself having to return the dowry money to his uncle, and at the same time to have lended that money to the villain Kuheiji, who was also his rival in love for the prostitute Ohatsu. Kuheiji not only refuses to return the money, but accuses Tokubei of having robbed him himself. Ohatsu fears that Kuheiji will use that money to free her from her contract with the brothel where she works and then marry her. Tokubei tries in every way but cannot find a way to get out of the situation. Ohatsu imagines a future with Kuheiji and without Tokubei. The two then decide to die together by committing suicide. 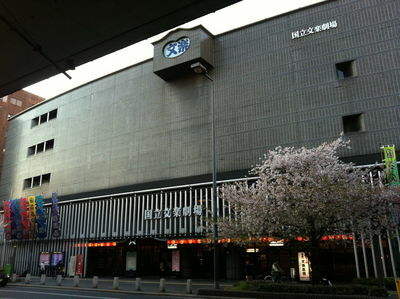 The National Bunraku Center is located in Osaka, in the neighborhood of Namba. It is the only theater in all of Japan where it is possible to attend regularly, at different times of the year, with precise calendars, to bunraku shows. The shows generally go on stage during the months of January, April, June, July, August and November. The theater is well organized to accommodate foreign tourists, with a useful website in English to check the calendar of events in the following months and also to buy tickets online. For most shows a headset rental service is also available to follow the show translated into English (further information here). The shows usually last 4 hours and 15 minutes and generally include 2 or 3 works. A ticket costs around 2500-3000 ¥. For tourists who have the only curiosity to see maybe a single representation (lasting about an hour) instead of an entire show, at the ticket offices of the theater you can buy tickets for only a part of the show. The National Theater of Tokyo, not far from the Imperial Palae in the central area of Hayabusa, is a large theater complex that hosts year-round performances of many traditional Japanese arts, including bunraku. 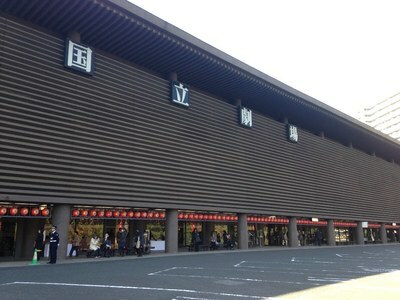 Compared to the National Bunraku Center in Osaka, the frequency of bunraku shows is much lower. Also for this theater you can use the useful website in English to check the calendar of events in the following months and also to buy tickets online.